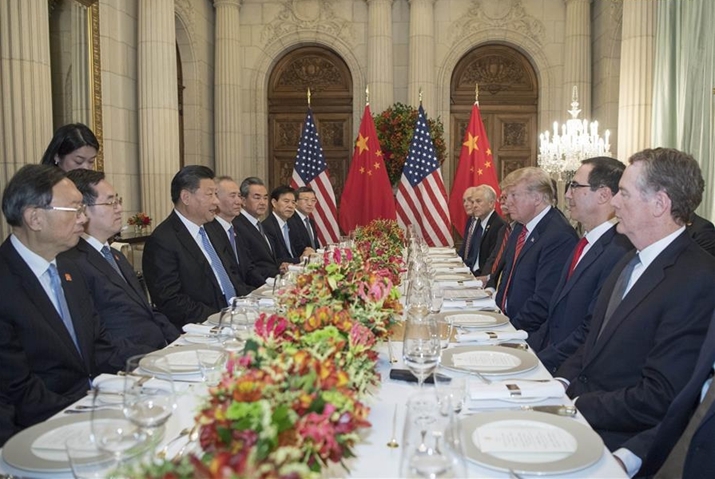 Chinese President Xi Jinping and his U.S. counterpart Donald Trump held a "highly successful meeting" in Buenos Aires, on December 1, reaching important consensus and agreeing not to impose new additional tariffs. The two heads of state had an in-depth exchange of views on China-U.S. relations and international issues of common concern in a friendly and candid atmosphere at a working dinner after the conclusion of the 13th summit of the Group of 20 in Argentina. Sound China-U.S. relations, Xi said, are in line with the fundamental interests of the two peoples and the broad-based expectations of the international community. He called on both China and the United States to handle the development of bilateral relations from an overall perspective and push for long-term, healthy and stable development of bilateral ties. Trump said that he agrees with Xi on his evaluation of U.S.-China relations. U.S.-China relations are very special and important, Trump said, adding that it is in the interest of the two countries as well as the world that the United States and China, both countries of significant influence, maintain a good cooperative relationship. The U.S. side, he added, is ready to increase cooperation with China through consultations and actively seek mutually beneficial solutions to their problems. The two leaders agreed to expand cooperation based on reciprocity and mutual benefit and manage differences based on mutual respect, so as to jointly advance China-U.S. relations with coordination, cooperation and stability as the defining features. They also agreed to maintain close exchanges in various forms to jointly chart the course for the development of China-U.S. relations, and pledged to hold further exchanges of visits at an appropriate time. It was the first meeting between Xi and Trump since the U.S. president paid a state visit to China in November last year. The world, Xi said, has witnessed a lot of changes since then. As two major countries with great influence, China and the United States shoulder important responsibilities in promoting world peace and prosperity, Xi told Trump. Cooperation is the best choice for China and the United States, he said. On economic and trade issues, Xi said that it is very normal that the two countries have some disagreements in the fields of economy and trade, adding that the key is to manage their differences properly and work out a solution acceptable to both sides in the spirit of mutual respect, equality and mutual benefit. They agreed not to impose new additional tariffs, and instructed the economic teams of both sides to step up negotiations toward the removal of all additional tariffs and reach a concrete deal that is mutually beneficial and win-win. Xi also reiterated China's stance on the Taiwan issue and the U.S. side pledged to continue to adhere to the one-China policy. The two leaders also exchanged views on the Korean Peninsula situation and other major international and regional issues. The meeting lasted for two and a half hours, much longer than planned, said Chinese State Councilor and Foreign Minister Wang Yi at a briefing on the closely-watched Xi-Trump meeting. "The meeting was very successful and produced important consensus. It provides direction for China-U.S. relations in the time to come," Wang said. In a White House press release, Trump was quoted as saying that this was an amazing and productive meeting with unlimited possibilities for both the United States and China. "It is my great honor to be working with President Xi," Trump said. Experts said that the important meeting sends a positive signal in the development of China-U.S. relations, one of the most important bilateral ties in the world. It suggests that cooperation is the key to the solution of problems, said Zhu Feng, a professor with the School of International Studies at Peking University, adding that given the differences between China and the United States in institutions, industrial policies and markets, Xi and Trump have demonstrated strategic courage and resolution at the dinner table. Berthold Kuhn, a China expert with the Free University of Berlin, noted that the meeting was "a first step" toward the settlement of China-U.S. trade disputes and more time is still needed for negotiation. "I am ... slightly optimistic," he said.